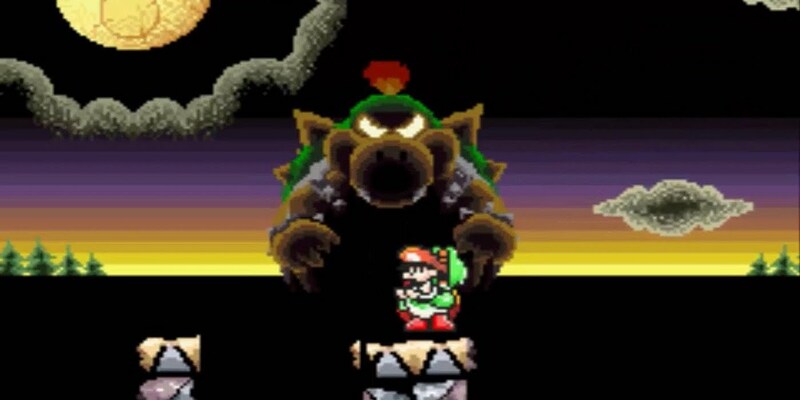 Up until this point in Nintendo’s history, Mario had a minimal amount of health that usually saw him shrinking in size or ditching his special ability whenever he would receive damage from an enemy. Yoshi’s Island flipped the script for this idea in a creative way where rather than Yoshi himself having a health meter and receiving damage, more of an assist system was adopted. Whenever Yoshi “loses health” the Baby Mario that he is protecting floats away in a bubble and requires you to reunite with him before a countdown timer runs out. Yoshi’s Island would also mark the first appearance of Yoshi’s iconic “flutter jump” joining the character’s repertoire, a move which has become a staple and appeared in every Yoshi game since. There continues to exist a great deal of debate over whether Super Mario World 2: Yoshi’s Island or its predecessor is the better SNES game. While a great deal of nostalgia is naturally rooted into the original Super Mario World, the consensus tends to be that Yoshi’s Island expands on the gameplay, content, and art design of the original in deep, impressive ways. Yoshi’s Island was a bona fide success with gamers, raking in four million copies in the sales, firmly placing it within the top ten selling games on the SNES. In addition to the title’s commercial triumphs, Yoshi’s Island has continued to receive accolades from critics and publications. The game came in 22nd on the UK’s Official Nintendo Magazine’s “Top 100 Nintendo Games” list in 2009, number 15 on IGN’s “Top 125 Nintendo Games of all Time” conducted in 2014, and ranks 2nd on USGamer’s “Best Mario Platformers” list that was done in 2015. More technically impressive Nintendo and Mario games have seen release over the years, but it’s still astounding that a platformer from 1995 can cause such a stir. For many, that sound of a wailing Baby Mario is forever burned in their ear drums. Tetris Attack is an extremely interesting Super Nintendo puzzler for a number of reasons. To begin with, it’s not really Tetris. Nintendo “bought” the Tetris name from Henk Rogers to put on their existing Panel de Pon franchise for its American release. In addition to the US version of Panel de Pon receiving a Tetris makeover, the localization inserted a huge helping of Yoshi iconography into the series due to the character’s popularity after Yoshi’s Island. Tetris Attack doesn’t just feature Yoshi sprites though, the character’s representation is so heavy in the game that it might as well be called Yoshi’s Island: Puzzle Edition. The entire game is centered around Bowser cursing Yoshi’s friends and it being up to you to save them. There’s even a Story Mode where you get to explore Yoshi’s Island as the titular character that straight up feels like a Yoshi adventure game. Yoshi’s popularity from Yoshi’s Island would also see the character making a brief cameo on Cranky’s Video Game Heroes board in Donkey Kong Country 2. It doesn’t have quite the same cache as taking down Bowser in a “Tetris” avalanche. It’s a real shame that young gamers no longer have a publication like Nintendo Power that’s out there to reward them with cool and exclusive gaming goodies. In the days before the Internet ruled all, Nintendo Power wasn’t just the place to get the best tips and tricks for Nintendo releases, but also the place to get your hands on all the coolest Nintendo giveaways. To capitalize on the public’s love for Yoshi’s Island, the official Nintendo publication started releasing promotional trading cards from the game as part of their Super Power Club card series. Beginning in Volume 44 of Nintendo Power from October of 1992, eight cards representing Yoshi’s Island would be released over time. These cards decided to focus on the various bosses from Yoshi’s Island, rather than its cute protagonists, offering up an image of the character from in-game, as well as a description of the foe on the reverse side. These cards featured Yoshi’s Island behemoths like Raphael the Raven, Bigger Boo, Burt the Bashful, Sluggy the Unshaven, and Naval Piranha. Anyone still have a Hookbill the Koopa rookie card? It’s a little crazy to think that if a bunch of watered down Yoshi titles were never made that Shigeru Miyamoto might have never created the platforming masterpiece that is Yoshi’s Island. Miyamoto might have introduced the world to Mario’s dinosaur-like sidekick in Super Mario World, but that didn’t stop Nintendo from making a number of off-shoot games involving the character, such as Yoshi’s Cookie, Yoshi’s Egg (Yoshi), and Yoshi’s Safari. After the breakthroughs made in Super Mario World, Miyamoto was even considering making Yoshi the “next hero” of the Mario series, but thought that the character was also in need of redemption. Miyamoto might not have hated the slew of Yoshi puzzle games that followed Super Mario World, but he thought that they didn’t properly tap in to the character. With Miyamoto being more set than ever on creating an “authentic” Yoshi experience, the game designer’s efforts went into overdrive to give Yoshi his proper follow-up in Yoshi’s Island. In other words, nobody should be holding their breath for a Yoshi’s Safari 2 on the Nintendo Switch. Some of this information is meant to purely titillate the trivia-hungry sections of the human mind, but if anyone is still struggling with World 3 in Yoshi’s Island after two decades, get ready for a gamechanger that’s going to make your year. The majority of the bosses in Yoshi’s Island are run-of-the-mill enemies that experience a case of gigantism courtesy of Kamek’s magic. However, if Yoshi stays on the edge of the boss’s ledge, so as to not trigger the transformation sequence, he’ll be able to launch an egg at Naval Piranha’s un-transformed form and end the boss before the battle even begins. The trick is clearly meant to be discovered rather than some glitch in the game, as pulling this off will even result in Kamek shouting “OH MY!! !” in alarm and fleeing the scene. It wasn’t enough for Yoshi’s Island to be the sequel to essentially the most successful game on the console, Nintendo was set on pulling out all the stops to make sure that this game could not be ignored. Some of the more extensive advertising efforts saw Nintendo releasing several promotional videos that were used to introduce people to the game and its many idiosyncrasies. “Super Mario World 2: Yoshi’s Island: A Magical Tour of Yoshi’s Island” might have only been six minutes long, but it worked as a very effective sizzle reel for the title. Ken Lobb, video game designer known most famously for his work on Killer Instinct and Goldeneye 007 (and currently working for Microsoft Studios) even appeared throughout the video in an attempt at professional insider endorsement for the game. Yoshi’s Island also received promotion through “The Invasion of Nintendo” promo VHS, too. Gamers might take for granted how plentiful game footage, speed runs, and “Let’s Plays” have dominated YouTube, but before all of that simply getting an early glimpse of a video game was a big deal. Besides, who doesn’t want to have their own personal loopable copy of Ken Lobb? It’s fascinating to notice and track certain patterns throughout Nintendo’s development career. Before the company was creating Expansion Pack add-ons for the Nintendo 64 or revised versions of their handhelds, they were playing around with RAM capacity and graphical limitations on the Super Nintendo. Games were still contained to a standard cartridge, but a number of SNES titles did require extra pieces of tech that would allow games to surpass the system’s usual limitations. Titles like Star Fox and Stunt Race FX made use of the Super Nintendo’s original Super FX Chip, but as further innovations were discovered, the invention of the Super FX2 Chip took place. This Super FX2 Chip was instrumental in helping Yoshi’s Island with areas like rendering, sprite scaling, sprite rotation, and basically any instance where sprites were being altered by “special effects.” A prime example of the Super FX2 Chip in work is in the humongous transformations that the game’s bosses undergo (later being referred to as “Morphmation” technology) or the psychedelic filter in play with the Fuzzies. The other Super FX2 Chip games are Doom and Winter Gold, but when’s the last time you heard anyone writing about the latter twenty years later? With video games being the sprawling, immersive projects that they are, it’s not that unusual for elements from them to end up on the cutting room floor. That being said, some rather curious edits from Yoshi’s Island remain lingering in the title’s raw data, hinting at alternatives that nearly existed. Some of the removed content shows off Red Bullet Bills, variations on the Bloo Blah and Piro Dangle, not to mention a number of different behaviors and patterns for Yoshi’s many enemies in the game. The majority of these last-minute eliminations are pretty inconsequential, but one happens to stand out as a particularly unusual inclusion. There’s an enemy removed from the title that ostensibly resembles Donkey Kong, only he’s given a Yoshi’s Island facelift in terms of graphics and design. The unused sprite data even comes with a barrel that he would have presumably hurled at Yoshi. With the complicated history that Yoshi’s Island and Donkey Kong Country shared, it’s easy to see why this enemy was at one point considered, then ultimately deleted. Sure, Mario titles and the bulk of Nintendo’s library don’t have the most intricate chronology in place. They’re certainly no Resident Evil or Metal Gear Solid in terms of complex timelines to reconcile. In spite of Nintendo’s catalog usually focusing on gameplay or aesthetics versus complicated story mechanics, the Yoshi’s Island series has still managed to find itself worked into a surprisingly regimented timeline. Yoshi’s Island began as a prequel to Super Mario World, but following its release, titles like Yoshi Touch & Go and Yoshi Topsy Turvy acted as spinoffs that would re-explore former Yoshi titles. Yoshi’s Story for the N64 functioned as the first sequel (and was even briefly titled Yoshi’s Island 64), but years later Yoshi’s New Island was released for the Nintendo DS, which takes place immediately after Yoshi’s Island, pushing Yoshi’s Story back in the timeline accordingly. Furthermore, the release of Yoshi’s Island DS inserts itself between Yoshi’s New Island and Yoshi’s Story, as well as introducing Baby Wario, Baby Peach, and Baby Donkey Kong. The most recent title, Yoshi’s Wooly World, caps off the series, but with all of the prequels, sequels, mid-quels, and side stories, the franchise has become increasingly complex. One of the Yoshi’s Island series’ most iconic traits is the beautiful art design that carries across through the many titles in the series. Whether it’s a storybook makeover, a heavy embracing of crayon and cartoonish visuals, or full-on transforming the world into yarn, the Yoshi’s Island games are just dripping in style. When taking all of this into consideration, it becomes especially surprising to learn that this origin of the series’ art design is practically born out of spite. Yoshi’s Island’s hand-drawn graphics and aesthetics were praised during the game’s release, but they might not have come to pass if Shigeru Miyamoto wasn’t given such a hard time regarding his decisions and simply embraced the pre-rendered graphical design used in the successful Donkey Kong Country. Miyamoto’s original design plans were turned down by Nintendo’s marketing department for not being enough like Donkey Kong Country’s. Miyamoto was frustrated over the fact that marketing was more interested in showcasing graphics and hardware power while he was more concerned about making art. Rather than listening, Miyamoto doubled down on his cartoonish style by incorporating the hand-drawn, crayon aesthetics instead, which the marketing department ended up loving. Sometimes art wins. A growing trend in Mario titles is the increasingly long grocery list of secret items that will be hidden throughout levels in order to obtain that coveted 100%. Yoshi’s Island introduces red coins and flower petals as collectibles to find and frustrate players throughout the game. Both of these items feel like fairly natural additions and progressions to the series, but Yoshi’s Island actually manages to stir up a little bit of controversy regarding one of its red coins. In the stage “Extra 3: More Monkey Madness,” there’s a peg with a Tap-Tap on top of it and a Paddle-Wheel rotating above it all, making it a reasonably hard target to reach. That being said, the game’s 21st red coin is underneath that peg. 21 seems like a pretty awkward number rather than a round 20. Plus, in the Game Boy Advance port, Yoshi’s Island: Super Mario Advance 3, this red coin is removed entirely. This makes it feel even more like the coin is a glitch or mistake in the original title. All the same, it’s there for the taking if you’ve got the right skills. It’s a lot of fun to play Yoshi’s Island, but have you ever found yourself thinking, “Man, wouldn’t it be great if this were a book”? Well evidently a lot of people felt this way and it’s why there’s not only one manga adaptation of Yoshi’s Island, but three, so you can have your pick of which sort of novelized madness is most up your alley. 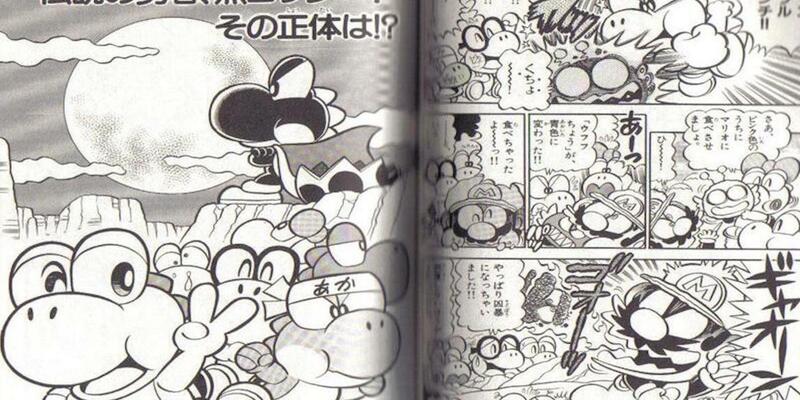 There are already a few existing Mario manga series in Japan, one of which is Super Mario-kun. The series devotes volumes 14 and 15 to a Yoshi’s Island adaptation that spices things up by having Mario and Luigi travel back in time to help Yoshi and Baby Mario out. Super Mario-kun is already comedic in nature, but there’s also a 4-Koma Gag Battle series of stories that pushes things even further in its own take on the material. Finally, a standalone manga was also released under the title, Super Mario: Yoshi Island, which lasted three volumes and was penned by Kazuki Motoyama, who believe it or not has also written a manga adaptation of the NES game Yoshi. Only the best here. Yoshi’s Island introduced yet another fascinating dimension to its series with its incorporation of transformations that Yoshi would undergo. As if Yoshi wasn’t already versatile enough, these transformations—which mostly saw you turning into different sorts of vehicles—would help aid you through specific levels. These transformations have proven to be so popular that they’ve been present in almost all of the Yoshi’s Island games since. Just like the raw data of Yoshi’s Island has several unused enemies and animations present, there are also a few unused morph ball transformations that hit the cutting room floor. One of these transformations is a plane, which was likely cut out due to the game’s helicopter transformation, but the other two are a mushroom (it hops) and a tree (it walks) transformation. While it would surely be a lot of fun to play as these bizarre creatures, it’s probably for the best that they were removed in the end. The plane transformation would eventually appear in Yoshi’s Wooly World, but people are still waiting anxiously for the appearance of Tree and Shroom Yoshi. Trading cards, promotional VHS tapes, and all the commercials and good publicity in the world are nothing in comparison to the sort of outside of the box thinking that Nintendo put on display for Yoshi’s Island. On October 5, 1995 at 3pm at a Toys “R” Us in Culver City, California, a huge live event was hosted to kick off the North American release of the game. This event centered around the “hatching” of a giant Yoshi egg that was on display for everyone. Children were lined up, given green hammers, and instructed to whack away at a specific portion of the egg, which ended up concealing a giant mock-up of the Yoshi’s Island cartridge. On top of that, the event was donating $500 to every local school whose principal would sit on top of the giant egg for fifteen minutes. A forklift was required for this maneuver. This frivolity is kind of beautiful and would make for a truly surreal experience. Lining around the block for a midnight release is one thing, but it’s no forklift on top of a giant egg while children work away with hammers below you. But what do you think? Yoshi’s Island is a big, big place. Do you have a better secret or piece of trivia for the game? Let your voices be heard below!